At 12.30pm on 27 June 1976 Air FranceFlight 139, an Airbus A300 with 238 passengers and a crew of 12, originating at Ben Gurion International Airport, Tel Aviv, left Athens for Paris. Shortly into the flight, two Palestinians from the Popular Front for the Liberation of Palestine, along with German terrorists Wilfried Bose and Brigitte Kuhlmann, hijacked the plane. The plane was diverted to Benghazi, Libya, and then at 3.15am on 28 June it landed at Entebbe Airport in Uganda, where the four hijackers were joined by three more. The hijackers demanded the release of 53 prisoners held in various jails worldwide and threatened to begin killing hostages from 1 July. The hijackers separated the passengers into Jews and gentiles and released all but 83 Israelis and French Jews. One holocaust survivor showed Bose his concentration camp tattoo. “I’m no Nazi … I am an idealist,” replied Bose. 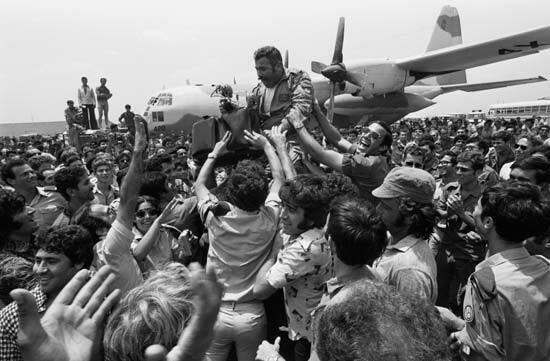 The entire crew refused to leave the Israeli and Jewish passengers and the hostages were moved to the transit hall of the airport, where they stayed for a week. On 3 July the Israel cabinet approved a rescue attempt. One hundred Israeli troops set out for Uganda, landing at llpm. They immediately went into action, attacking the terminal building, shouting, “Get down!” in Hebrew and English. French Jew Jean-Jacques Maimoni, 19, was accidentally killed by the Israelis, as were fellow hostages Pasco Cohen, 52, and 56-year-old Ida Borochovitch. Ten others were wounded in the shooting. The Israelis killed all the kidnappers. Yonatan Netanyahu was the only Israeli commando who died during the operation, although five were wounded. The entire event took just 35 minutes the Israelis were airborne by 12.40am on 4 July. As the Israelis loaded the hostages onto their plane, Ugandan military personnel opened fire on them. Forty-five Ugandan soldiers were killed and 11 Ugandan Army Air Force MiG-17 fighter planes were destroyed. One hostage, Dora Bloch, 75, had been taken to Mulago Hospital in Kampala where two Ugandan army officers dragged her from her bed and killed her. The Ugandan government tried and failed to have Israel sanctioned at the United Nations. The leader of the assault force, Lieutenant-Colonel Yonatan Netanyahu, the only Israeli to die, was the elder brother of Binyamin Netanyahu, Israel’s Prime Minister from 1996-99.